We believe it is time for investors to become increasingly defensive. US stock price valuations are stretched to historic levels. Many economic growth indicators have overheated creating the dual risk of rising inflationary pressures and the bursting of an equity bubble. 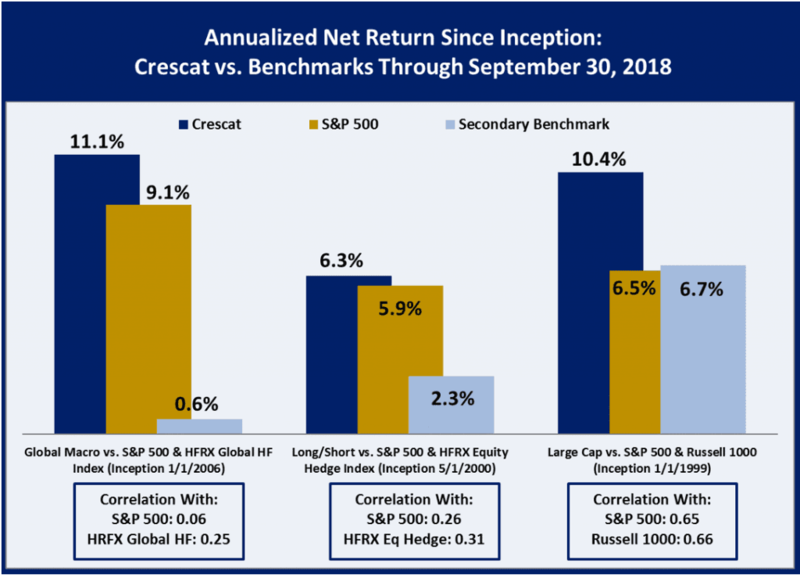 In our hedge funds, Crescat remains positioned to capitalize on a cyclical equity market downturn. Despite hitting record high US index values in the third quarter, weakening market internals emboldened us to stay net short in our hedge funds all year. Weak internals have included: 1. An increasing number of NYSE new 52-week lows year to date; 2. The Dow Jones Industrial Average hitting at an all-time high as recently as October 3, but the Smart Money Flow Index flashing a bear signal since February; and 3. As of the end of September, 17% of the components of the S&P 500 Index were down 20% or more from their 52-week highs; while 43% were down at least 10%. Our fortitude in staying net short has already been paying off strongly in October. By investors needing to become more defensive, we do not mean that it’s time to buy utility stocks. Utilities are the worst scoring sector in our fundamental model today due to bloated balance sheets, negative FCF, and over-valuation. Being defensive to us means that one should consider an allocation to a global macro and/or long short hedge fund manager with a proven track-record of capitalizing on varying market cycles including downturns. We believe that global investors have far too much long US equity exposure today. Our negative sentiment regarding China has grown stronger. China’s manufacturing activity grew at the slowest pace in more than a year in August, with export orders shrinking for a fifth month and employers cutting more staff. Findings reinforce views of a further downturn in China’s economy in coming months, as the US ramps up tariffs on Chinese goods. The Beijing-based Cheung Kong Graduate School of Business Overall Business Conditions Index indicates that China is already in a recession. China’s economy was already showing signs of stress before the U.S. trade war flared. A regulatory crackdown on financial risks and debt was pushing up borrowing costs and making it tougher for firms to get funding, sparking a growing number of defaults. But the steady reports of weaker export orders suggest the deepening trade dispute is now adding to that pressure, with the impact starting to ripple through to China’s factory floors. New export orders — an indicator of future activity — have contracted for the longest stretch since the first half of 2016. Crescat continues to believe that China is by far the biggest credit bubble in the world, one that is already in the process of bursting. China’s stock market is mired in bear territory and the yuan is down almost 10% since April of this year, moves that Crescat has capitalized on and remains positioned for in our hedge funds. While China has USD 3.1 trillion of FX reserves, it cannot prevent the yuan from further significant decline when China’s total banking system credit is about 16 times that including USD 10 trillion of non-performing loans. Gold prices may already have hit bottom for the year after declining for the past six months in a row—the longest streak of losses in nearly three decades. Lower prices have contributed to a boost in global central bank purchases of gold. Global central banks added a net total of 193.3 metric tons of gold to their reserves in the first six months of this year, up 8% from 178.6 metric tons in the same period a year earlier, according to the World Gold Council. That marked the strongest central bank gold purchases in the first half of a year since 2015. Other signs of a potential bottom for the metal include recent merger activity in the precious metals mining sector and record speculative net-short positions in gold and silver futures, both potential signs of a coming turnaround for the group. Crescat’s macro gold model shows that it trades at the steepest discount ever compared to the G20 monetary base. Silver trades at the cheapest value to gold meanwhile in 26 years. Finally, gold and silver mining stocks trade at their combined cheapest valuation multiples in their history according to Crescat’s fundamental equity model. Today, with the stock market down MTD and Trump attacking the Fed, precious metals and precious metals mining stocks appear to be taking off benefitting our positioning in all three Crescat strategies. 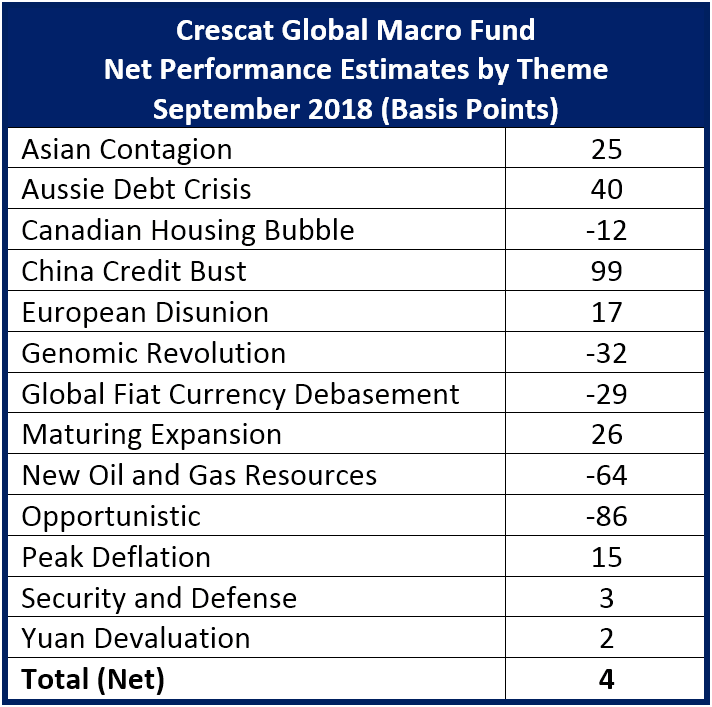 Crescat’s performance in and through September is shown below. The biggest contributors to performance in both hedge funds in September were China equity shorts and Aussie bank shorts as well as short positions in Wynn Resorts and Micron Technology. The biggest detractor in the Crescat Global Macro Fund was long positions in 10- and 30-year US Treasury futures, a short-term hedge versus our core foreign sovereign debt short positions in that fund. With the recent breakout in US long-term yields, we have exited the long Treasury side of that trade. The biggest contributor in Crescat Large Cap was Fortinet while the biggest detractor was Lumentum Holdings, long equity positions in all Crescat strategies as part of our security and defense theme. Given historic market uncertainty, we believe today presents a rare opportunity to capitalize on our investment themes when our conviction has never been stronger. Crescat Capital’s mission since inception has remained constant: to protect and grow wealth for our clients over the long term. We stand ready to speak with you regarding our funds, ideas and process. Please reach out to let us know how we can help you.